There is a little restaurant about 10 minutes from my house that serves the most amazing dessert called Russian Cream. Russian Cream is a mix between a custard and a pudding. It has a creamy velvety texture that melts in your mouth. The flavor reminds me of homemade vanilla ice cream. I found this recipe on-line and I have loved how simple it is to make. It only takes 6 ingredients. I always like to top it off with some fresh strawberries and blueberries. It just needs to be refrigerated for 4 hours to set up before you serve it. It is such an elegant dessert that it is sure to impress even your toughest dinner guests! 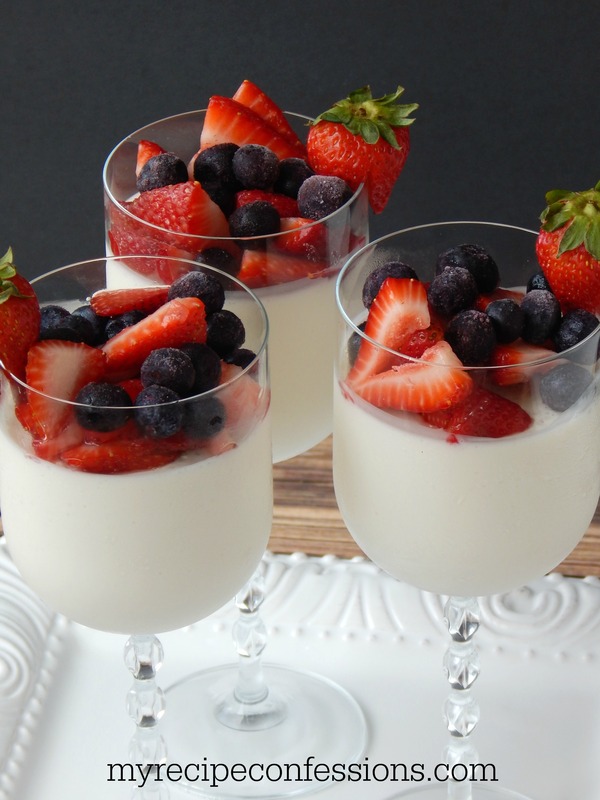 This dessert would be perfect to serve at your Memorial Day picnic or your Fourth of July barbecue. I have a feeling your guests will be talking about it for years to come. 1. In a small sauce pan, blend the sugar and gelatin. Add the water and mix well and let stand for 5 minutes. Then while stirring, bring to a full rolling boil. 2. Remove the sugar mixture from the heat and mix in the whipping cream. In a small bowl, mix the vanilla into the sour cream. 3. Gently mix the sugar mixture into the sour cream. 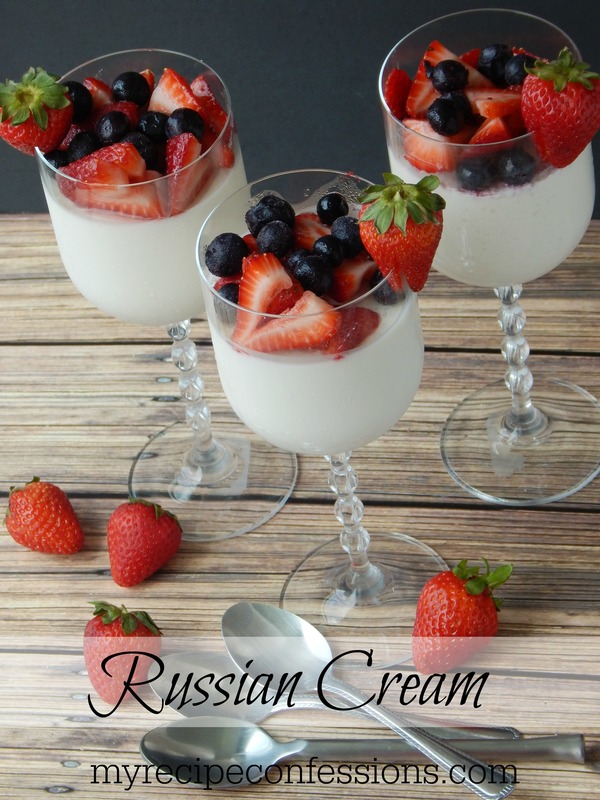 Pour Russian Cream into 8 small dessert cups, goblets, or ramekins. Cover and chill until set for at least 4 hours or overnight. 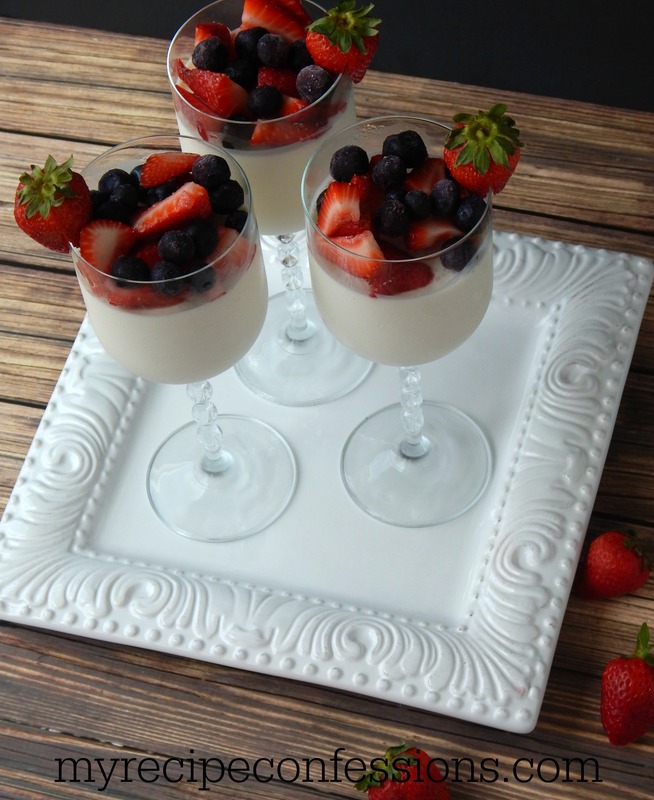 Serve with fresh strawberries and blueberries on top.